There’s been a lot of talk about long books over the past ten days: the Man Booker-winning The Luminaries weighs in at 832 pages and Donna Tartt’s The Goldfinch, for which many of us have been waiting for a decade, stretches to 784 pages. My heart always sinks a little when a big book comes into view on the TBR shelves, partly because there are so many others coming up behind and partly because too often when I reach the end of a long book I feel that a good 100 pages could have been axed. Not so with Elizabeth Gilbert’s The Signature of All Things which just clips the 500-page bar. It’s big in the best sense of the word, spanning a century in which ideas about the world changed incontrovertibly – shockingly for many – and exploring those ideas through the life of the unforgettable Alma Whittaker. It opens with clever but light-fingered Henry, son of the Apple Magus of Kew, caught stealing precious plants and handed over to the celebrated botanist Sir Joseph Banks for punishment. Banks recognises talent when he sees it and despatches Henry on Captain Cook’s third and final voyage to collect specimens, then to Peru. Henry finally fetches up in Philadelphia, sets up a thriving botanical business, marries a stalwart Dutch woman with a mind as sharp as his own and an education to match, and fathers a daughter, fiercely intelligent and passionate about botany from the age of five. Into this intellectual hothouse comes Prudence, orphaned, beautiful and circumspect – chalk to Alma’s sassy, knowing cheese. Gilbert explores many of the big ideas of the nineteenth century through these two. Prudence marries their tutor, a passionate abolitionist, and dedicates herself to the cause but it is Alma and her passion first for the wide world of botany, then for the moss which grows so abundantly at White Acre – a passion which will eventually take her to the ends of the earth – who is the central figure of the novel. The Signature of All Things is clearly the product of a great deal of research – even its title is a reference to Boehme’s arcane botanical theories – but it’s research that’s worn lightly and never intrudes. There is a great deal of playful, sly wit reminiscent of Daniel Kehlmann’s Measuring the World and T C Boyle at his best, particularly evident in Henry’s voyages, described in all their stomach churning glory, and Alma’s sojourns in the binding closet. Alma’s character is so well drawn that she is utterly convincing – I felt the need to Google her when I finished the book and was disappointed not to find her. But, then, that’s the point: there was surely more than one unsung Alma out there, passionate and accomplished scientists who remained obediently at home when their mothers asked them to care for their elderly fathers. So, does your heart sink or leap at the thought of a doorstep-sized novel? Is life too short for more than 300 pages or does it depend on the author? What’s your page limit? Happy to knock off 800 pages in few days or would it take you until Christmas 2014 to finish The Luminaries? I’m interested to know what you think. 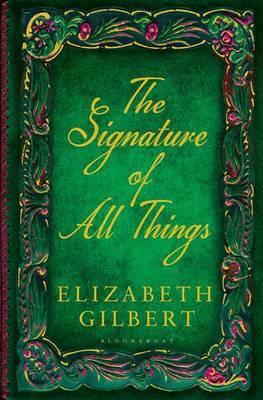 This entry was posted in Reviews and tagged Bloomsbury Books, Botany, Elizabeth Gilbert, Nineteenth century fiction, The Signature of All Things on 25 October 2013 by Susan Osborne.